All lemon trees should be fed during the winter months. Feed with a balanced fertiliser like 8:1:5 or 3:1:5. Large, established trees need about 2kg, while newly planted trees need about 300g of fertiliser. Sprinkle granules all the way from the stem to the outer drip line of the tree. Water well before and after feeding. Place a thick layer of organic mulch around the stem of the tree. 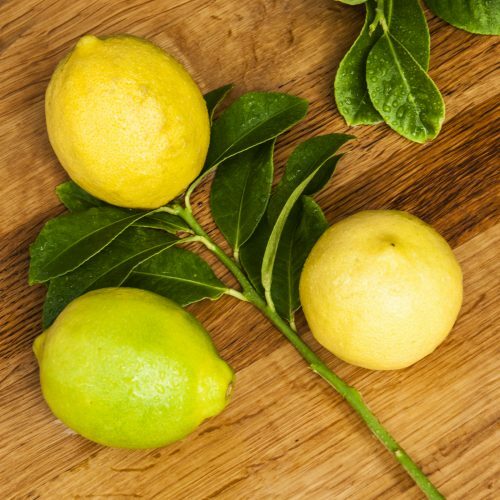 For an extra boost, feed your lemon tree with 75g of Epsom salts, which is a good source of magnesium and sulphur, which help to promote the development of blooms and fruit. The most common pest to target lemon trees is citrus psylla, which results in swelling on the top of the leaves, caused by insects underneath. Citrus psylla affects mainly young trees. Spray with Biogrow’s eco-friendly Pyrol or Bioneem, Margaret Robert’s Organic Insect Spray or Efekto’s Natural Insecticide. Enjoy the display of fruit on your tree! Lemons will stay fresh on the tree for a number of weeks and do not all have to be harvested as soon as they appear.